How does one put into words the outrage and hurt we feel at the slaughter of innocents in Paris this past week that included journalists, police and members of the French Jewish community? Anger, pain and a deep and profound sorrow. The journalists at satirical magazine, Charlie Hebdo were slaughtered because they represented our right to free speech and expression, a tenet valued as a fundamental value of a democratic society. Police were murdered because they uphold the law that is based on Western values. And four were murdered simply because they were Jewish. Their lives ended while shopping for last minute Shabbat provisions by a terrorist who gleefully admitted that he targeted them because they were Jewish. 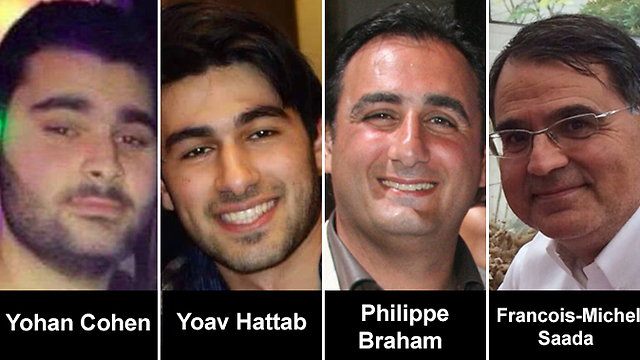 The Victims of the terror attack on Hyper Cacher, a kosher Supermarket in Paris. Israel and France share the same democratic, Western values. As Israelis we understand the veracity and trauma of terror that can hit anytime. As Jews we understand persecution and how it feels to be victims of hatred. The rising tide of anti-Semitism around the world makes this threat all the more real. As someone who makes a living sharing my opinion, which is sometimes less than well received, news that colleagues in my profession paid the ultimate price for what we value highly (and sometimes take for granted) which is our freedom of speech and expression was at once, sobering and frightening. Those of us who work in the field of Israel advocacy are no strangers to views that contravene ours. Sometimes these opinions even border on hate speech. We are used to cartoons that depict us in the most vile, anti-Semitic and stereotypical fashion. Social media has added a different dimension and Facebook trolls and Twitter twits have discovered an effective way of ensuring that their hate invective has a rapid and viral soapbox. We have dealt with all of the above by using the legal options available to us or by strongly worded letters and op-eds and the occasional meme but never a hail of bullets and carnage. During Operation Protective Edge in 2014, elements of South African society appealed to the leadership to silence me ahead of my impending visit. They were told in no uncertain terms that restricting my freedom of expression was against their constitution. While I respect their right to vehemently disagree with me, my answer is to take to the airwaves and the internet and keep on writing. That is my constitutional and inalienable right. 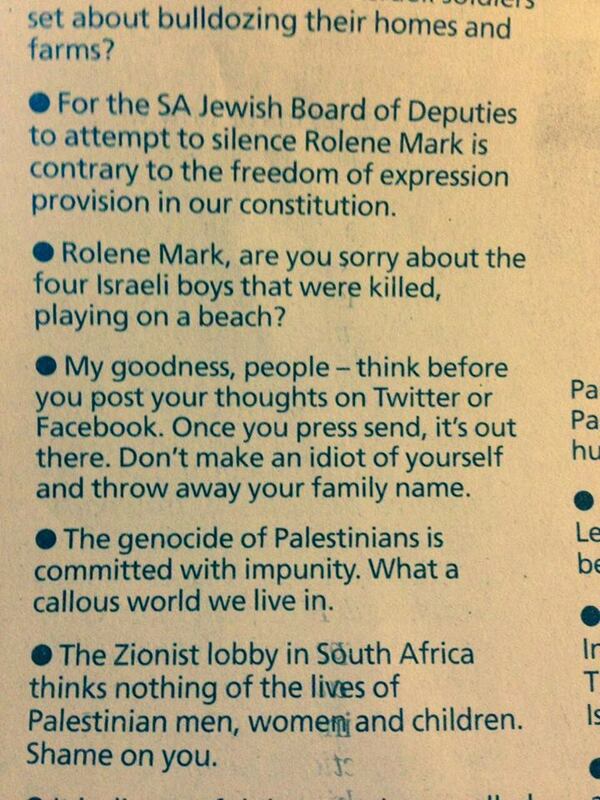 The South African Cape Times newspaper features the response to calls for me to be silenced during Operation Protective Edge – and gets the next post wrong! To allow ourselves to be intimidated by those who scorn our Western value system is to bow to terrorism. Artists draw your truth, writers share your views! 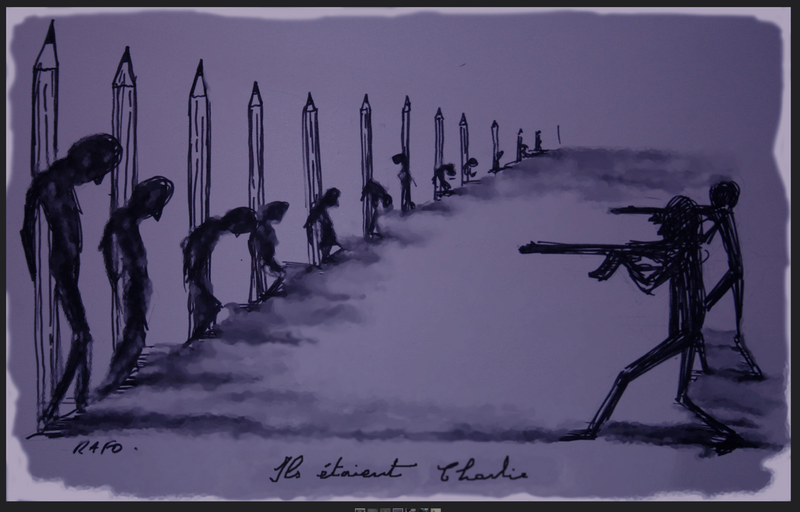 We owe it to those who were murdered in France and to everyone who has been killed by virtue of their opinion or religious affiliation to speak on their behalf. For us as Jews, these terror attacks are deeply personal. We are a nation that feels the pain of every person slaughtered by terrorists deeply. We are all responsible for each other and at this time we mourn and embrace the families of the victims in our hearts. Today we laid Yohan Cohen z”l, Yoav Hattab z”l, Phillipe Braham z”l and Francois-Michel Saaba z”l, to eternal rest in the peaceful hills of Jerusalem. We have buried too many, far too many victims of terror. This is not the way we want to bring Jews home to Israel. Making Aliyah, coming home to our ancestral home should be a joyous occasion. For many, this is not the case. A global tsunami of hatred is forcing them to leave the countries that they feel deeply rooted in, despite a strong love and connection to Israel. Whatever reasons anyone decides to call Israel home, we welcome you with open arms. 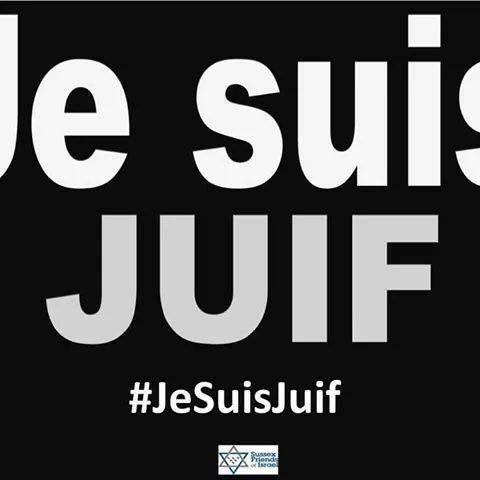 Solidarity – “I am a Jew”. Proudly! To the victims of these appalling attacks, you are always in our hearts and we will do our best to honour your memories by expressing ourselves or celebrating our Jewish and Zionist identities. To the mourners, may you be comforted and find healing and strength. May the pen forever be mightier than the sword. Je Suis Charlie. Je Suis Juif. Am Yisrael Chai. 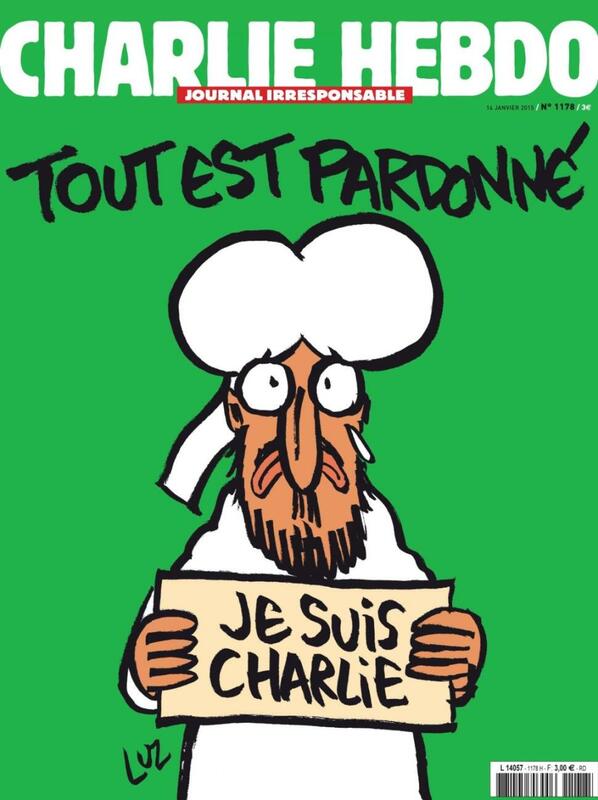 This week’s commemorative cover of Charlie Hebdo.